Remember when Solange attacked Jay Z in the elevator after the Met Ball and everyone thought that it was over Jay’s alleged relationship with Rihanna? How could anyone forget? It was truly a cultural milestone. 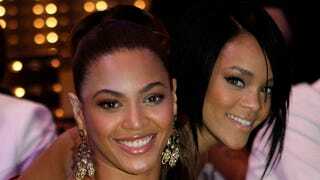 Anyway, turns out the Rihanna-Jay Z-Beyoncé love triangle was completely fabricated by Rihanna’s publicist. Yesterday, her son Deacon turned 12. Doesn’t he look ready to sail a little yacht?